We’ve all been there: faced with a dilemma and the little angel sits on one shoulder and the devil sits on the other and an argument ensues about which path you should take. Should you do the right thing even if it means risking your life (or your money) or should you do the selfish thing and take off with it all leaving your friends behind? This is the kind of situation we see Star Lord in through the Guardians of the Galaxy as well as his travel companions. Which path should they choose when faced to either save themselves or save their friends? As we see in the movie, even though they are tempted to make a run for it, they always stay behind and help each other out of sticky situations. Even though you may choose the right path, you're still the baddest outlaw in the galaxy and you need an outfit to match. 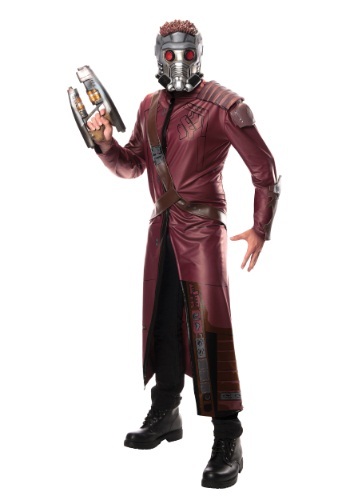 This licensed Star Lord costume comes straight from the Guardians of the Galaxy movie and you can bet you're going to be ready for some crazy space pirate action in this costume. The costume is made of 100% polyester and has a detailed brown jumpsuit with attached foam armor on the shoulders and arms. The killer bandolier is also attached to the jumpsuit, which closes up in the back with Velcro. Now, you don’t want everyone in the galaxy knowing your true identity, do you? So be sure to finish off your look with the Star Lord mask.